TS EAMCET 2018 Notification Released On Released on 02-03-2019 and Online Applications Start From 06-03-2018 Tto 05-04-2019. TS EAMCET 2019 is conducted by Jawaharlal Nehru Technological University Hyderabad on behalf of TSCHE.This examination is the prerequisite for admission into various professional courses offered in University/ Private Colleges in the state of Telangana for the academic year 2019-2020. In Engineering, Agriculture & Medical (Pharmacy,Veterinary etc.,) Through Common Entrance Test (TS EAMCET).This Common Entrance Test( TS EAMCET 2019) will be conduct Through CBT(Computer Based Test). 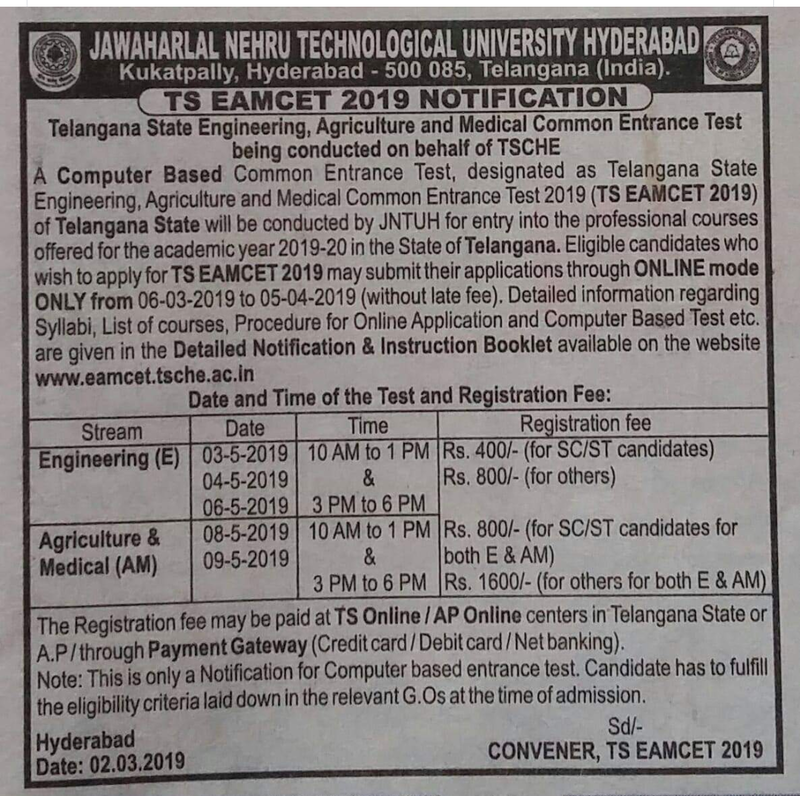 Telangana State Engineering, Agriculture and Medical Common Entrance Test – 2019 (TS EAMCET–2019) will be conducted (as per G.O. Ms.No. 73 Higher Education EC.2 Dept., Dt: 28- 07-2011, G.O.Ms.No.33 of Higher Education (TE/A2) Department dated 31-12-2014) by Jawaharlal Nehru Technological University Hyderabad (JNTUH) for entry into the first year of the following Under Graduate Professional courses offered for the academic year 2018-19 in the Universities & Private unaided and affiliated Professional colleges in the State of Telangana. Candidates satisfying the following requirements shall be eligible to appear for TS EAMCET-2018: a) Candidates should be of Indian Nationality or Persons of Indian Origin (PIO) / Overseas Citizen of India (OCI) Card Holders. i) Candidates should have passed or appeared for the final year of Intermediate Examination (10+2 pattern) with Mathematics, Physics along with Chemistry / Biotechnology / Biology as optionals or related vocational courses in the fields of Engineering and Technology, conducted by the Board of Intermediate Education, Telangana / Andhra Pradesh along with bridge course or courses conducted by it for candidates enrolled during 2000-2002 and subsequent batches, or any other examination recognized as equivalent thereto by the Board of Intermediate Education, Telangana / Andhra Pradesh, provided that candidates who have passed or appeared for the final year of Intermediate Examination (10+2 pattern) with Biology, Physics and Chemistry as optionals along with the bridge course examination in Mathematics conducted by the Board of Intermediate Education, Telangana / Andhra Pradesh shall also be eligible for the Bio-Technology course. Note: (1) Irrespective of the subjects taken at the qualifying examination, candidates seeking admission to the above courses in section 2(d) should appear for Biology, Physics and Chemistry in TSEAMCET-2019. (i) Candidates should have passed or appeared for the final year of the Intermediate Examination (10+2 pattern) with Physics, Chemistry and Biology optionals, conducted by the Board of Intermediate Education, Telangana / Andhra Pradesh or any other examination recognized by the University as equivalent thereto. (i) Candidates should have passed or appeared for the final year of Intermediate examination (10+2 pattern) with Physics, Chemistry and Mathematics or Biology optionals conducted by the Board of Intermediate Education, Telangana / Andhra Pradesh or any other examination recognized by the Board of Intermediate Education, Telangana / Andhra Pradesh as equivalent thereto or should have passed or appeared at the final year of the Diploma examination in Pharmacy course conducted by the Telangana / Andhra Pradesh State Board of Technical Education and Training or any other examination recognized as equivalent thereto by the Telangana / Andhra Pradesh State Board of Technical Education and Training. 3. Proof of satisfying the marks criteria in respect of candidates who appeared for the Qualifying examination (10+2) during the year should be furnished within 7 days after publication of the examination results by the concerned examination Board. The main aim of the Normalization is to ensure that no student gets advantage/disadvantage due to multiple sessions. The normalization process brings all the candidates across all sessions on a comparative scale. Due to this process, the marks of the easy session may be reduced marginally and marks of hard session may increase marginally on the global scale. This depends exactly on the average performance in each session. Since care is taken to prepare papers of equal difficulty, these changes are expected to be very marginal. Normalized marks justify the candidates while respecting their actual performance. Hence, the following normalization procedure is adopted which is being followed by other competitive Examinations in India to avoid advantage/disadvantage to candidates in a particular session compared to the other sessions. Normalized marks of the candidate. Where, SASD: Sum of Average (A) and Standard Deviation (SD) of the subject of a session in which the candidate appeared. Note: For the candidates for whom there is no qualifying cut-off in TSEAMCET-2018, if the marks in TSEAMCET-2018 after normalization goes below zero (negative), the mark is treated as zero. If the tie persists, then TSEAMCET-2018 normalization marks (though negative) are considered for resolving the tie. 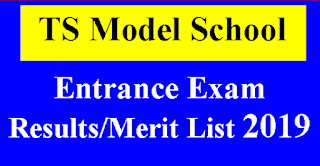 The candidates who have secured qualifying marks (Normalised marks) in TSEAMCET-2018 and candidates belonging to the category of Scheduled Caste and Schedule Tribe, for whom qualifying marks have not been prescribed, shall be assigned ranking in the order of merit on the basis of combined score obtained by giving 75% weightage to the Normalised marks secured in TSEAMCET-2018 and 25% weightage to the marks secured in the relevant group subjects namely Mathematics or Biology, Physics, Chemistry of the qualifying examination. Candidates with Mathematics, Physics, Chemistry / Bio-Tech. / Biology as optional subjects in their Intermediate or its equivalent course should submit “E” stream online application for Engineering B.E./ B.Tech. / B.Tech. (Ag. Engg.) / B.Tech. (Dairy Technology) / B.Tech. (FT) / B.Pharm. (MPC) / Pharm-D (MPC) courses. Candidates with Biology, Physics and Chemistry as optional subjects in their Intermediate or its equivalent course should submit “AM” stream online application for B.Sc. (Hons.) Agriculture / B.Sc(Hons.) Horticulture / B.Sc. (Forestry)/ B.V.Sc. & AH / B.F.Sc. / B.Tech. (FT) /B.Pharm. / B.Tech. (Bio- Technology) (Bi.P.C.) / Pharm-D (Bi.P.C) courses. For B.Tech. (Bio-Technology) (Bi.P.C), candidates shall pass / appear for Bridge Course exam in Mathematics conducted by B.I.E, A.P./ T.S. as per G.O. 17, Dt. 2-2-08.
i. As per the Gazette of India: Extraordinary under Part-III Rule No. 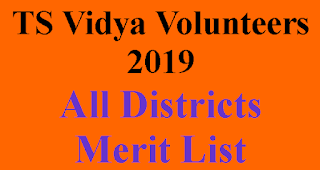 7(2) for admission into B.V.Sc. & AH Courses on the basis of competitive entrance examination, a candidate under General Category for admission to this course must have obtained 50% marks in English, Physics, Chemistry and Biology in their qualifying examination. In respect of candidates belongs to the Scheduled Caste / Scheduled Tribe or other special category of student as specified by the Government from time to time, marks required for admission shall be 10% less than that prescribed for general category. ii. As per G.O. Ms. No. 73,74 & 75 dated 28-07-2011, the candidate shall fulfill eligibility criteria for admission into Engineering, Pharmacy and Pharm-D courses. iii. G.O.Ms.No.5, H.E. (TE) Dept, dt.23.02.2018 iv. However, in all the cases, candidate shall fulfill the eligibility criteria as laid down in the relevant G.Os/Amendments/Notifications to be issued at the time of Admissions. TSEAMCET– 2018 application should be submitted through ONLINE mode only. Test Centre will be allotted at Hyderabad only. NOTE: 1. This is only a Notification for entrance test and not a Prospectus. Candidate has to fulfill the eligibility criteria laid down in the relevant G.Os at the time of admission. 2. Relevant GOs issued by the State Government may be referred from time to time for the eligibility to get scholarship after admission into the Professional courses. 3. 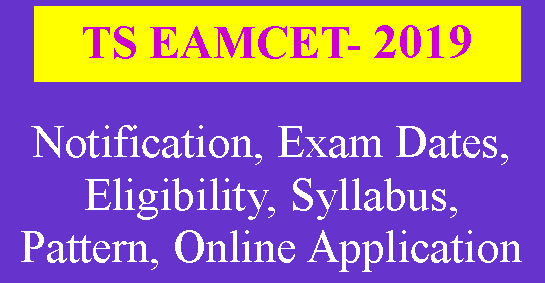 This Notification along with detailed procedure for Online submission of Application form and relevant information are available in the TS EAMCET-2018 website: eamcet.tsche.ac.in .